[Tim’s] miniMAME‘s construction follows the “light and cheap” approach, using foam core board and hot glue. Sure it won’t last a nuclear attack, but at least it’s light enough to carry to a friend’s house. With a removable netbook at the core, CCFLs, speakers, trackball, and mini arcade fighting stick, the project completely surpassed our expectations. For those looking to build a miniMAME, [Tim] includes lots of pictures, details, and plans allowing anyone to make their own in about an afternoon. ← Release the Kraken: Open source GSM cracking tool released. 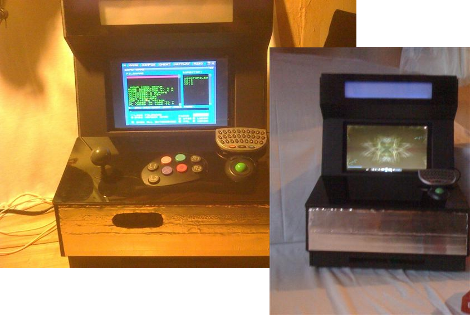 hackaday, why must you keep posting these miniature arcade cabinets? you’ve featured at least a dozen before, they aren’t functional and are ugly as sin. You could always, you know, not bother clicking on the article if you’re not interested in it. That’s usually what people with at least a little common sense do when they’re not interested in something. Cool Hack, I dig the pictures of each step. I usually forget to take pictures of the progression in my own projects. my gf’s bro owns that exact same netbook two! LOL I have a lenovo netbook, it pwns all of you. I use my netbook for retro gaming sometimes too. Guys, stop building out of foam board. go to a sign shop and get the stuff they use. It’s easy to bend with a hairdryer really easy to cut and is 8000X stronger and durable. It’s like foamboard but made of plastic. works GREAT. Go past the paper mockup stages and build it in something that will last more than 30 minutes. You will suddenly become a uber haxor instead of staying in the newbie category. Yeah, take THAT iPad arcade. You know where to stick it. Signshop material, you mean Coroplast? I’m gonna build a kayak outta that stuff next. It wasnt appropriate for this build. This is a mockup of one that will be cnc’d from acrylic or polycarbonate, thus the foamcore was cheap and available. Walmart @ 12:30AM.. lol try and find an open sign shop wher you really need an extra piece to finish. And is that what technology and hacks are about? Retro? But if people really like it then so be it, I for me like it in moderation and not quite so much of it. IDK about retro, netbooks have only been around for a few years. As far as hacks.. I have been hardware hacking since 1988 (i’m a F.O.B) I have always though of hacks as being a way of modifying something to suit a purpose for which it was not designed. Or taking something which does a little and modifying it so it does alot more or compares/serves purpose of a more expensive/capable item. Sorry man, but I’m sure my netbook beats yours. MSI Wind U100 with 2GB RAM, Atom CPU overclocked to 2GHz and GMA graphics overclocked, 500GB 5400 rpm hard drive, linux-compatible wi-fi card, set up to dual boot Crunchbang linux and Windows 7, and a Windows XP virtual machine installed on top of #! so I don’t have to restart to run windows programs. Booyah. I don’t think your overdoing the retro type articles at all. I love them and so do many of us. You give us a pretty good mix regardless. That said I’m liking this design because they weren’t afraid to mount a keyboard for added input help. When your going for accuracy on an arcade box the keyboard should be left out but when your going for fun it’s helpful. Many of us have that same exact Acer Aspire One. They are very handy. @ Brennan – No need to apologize, I have a laptop with great specs. Not to worried about being out done with my netbook, which cost me a total of $50 bcuz i repaired it. I bet my car is faster than your tho. lol. I can also pee further. @ Punkguyta – sorry that previous comment meant for another. This is my 2nd Acer Aspire One, my other one is tucked away for safety. I dig the idea of using one of those mini thumb keyboards. I wasn’t talking to you, but yeah, I bet you can pee further than me. Congratulations!